First chop the garlic and chilli. Place them in a bowl. Then add in water, fish sauce, sugar, lime juice and stir all the ingredients well. Put aside. Prepare a large bowl with hot water. Soak one Vietnamese spring roll wrapping in hot water for few seconds to soften. Then take it out from water, wipe it dry and place it flat on a plate. Shred the cucumber and cut sardines into chunks. In a row across the center, place a handful of sprouts, shredded cucumber, mint leaves and place 2 pieces chunks of sardines on top, leaving about 2 inches uncovered on each side. Fold uncovered sides inward; then tightly roll the wrapper from bottom on the top. You just need to repeat that for all spring rolls. 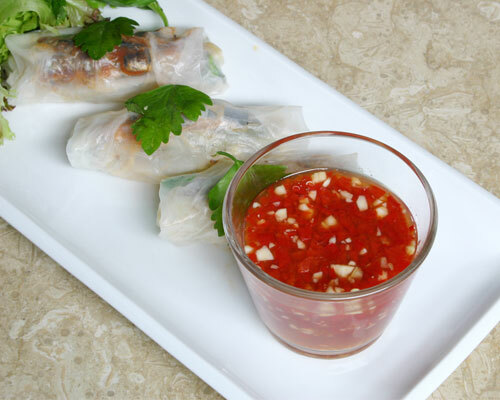 Serve the rolls whole, garnished with basil, cilantro leaves, lettuce and with the dipping sauce in a nice bowl.